United Students Against Sweatshops (USAS) is currently hiring a full-time Domestic Campaigns Coordinator to be based in Washington, DC. The Coordinator is responsible for overseeing all aspects of USAS Campus Worker Justice Campaigns and Student Worker Organizing Campaigns. The position offers a $50,000 salary, a comprehensive health benefits package, a union contract, flexible vacation time and opportunities for professional development and mentorship. The position requires a two-year commitment and a willingness to work flexible hours including nights and weekends. This individual would be joining a small team of national staff members but will often be expected to work independently. This position begins May 1st, 2019 with some flexibility. Application accepted on a rolling basis. 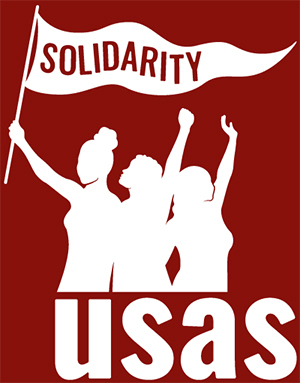 Since 1997, USAS has been the largest student-worker solidarity organization in the country, with locals on 150 college and university campuses. USAS leverages the strategic role of college students to support the formation and continued strength of unions in the US and around the world, with a focus on unions representing campus workers and garment workers abroad who manufacture collegiate licensed apparel. USAS’s work falls at the intersection of the student and worker movements as an independent, student-run organization. For more information on USAS, please visit www.usas.org. National staff work closely with students to support ongoing campus organizing; coordinate the activities of local organizations into international actions and campaigns; put together meetings, trainings, and conferences; maintain communication and coordination with domestic and international allies; and facilitate the infrastructure development of a dynamic movement. Ability to independently manage and direct one’s own work and work in groups. Click here to download the application. Follow the included instructions and email your completed application to: register@usas.org. USAS is an equal opportunity employer. Working class folks, women, LGBTQI+ people, immigrants, people of color, people with disabilities, are encouraged to apply.